(AP) — On one side of the Los Angeles Lakers’ practice court, Dwight Howard is shooting free throws and talking defense with Pau Gasol. On the other end, Kobe Bryant and Steve Nash are plotting out a pick-and-roll play with step-by-step precision. And somewhere in the middle, Metta World Peace’s mind is blowing. 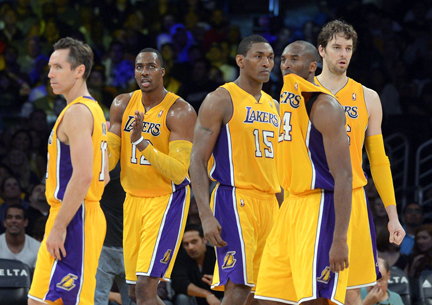 The Lakers are a fantasy basketball team brought to life this fall. Thanks to the nimble offseason moves of general manager Mitch Kupchak, Los Angeles has assembled one of the most accomplished starting lineups in NBA history, from Nash’s MVP awards and Bryant’s scoring superlatives to Howard’s defensive dominance and Gasol’s international acclaim. Whether those accomplishments translate into championship success will be learned over the next several months. The Lakers are loaded with talent, but it's mostly confined to the top half of their roster — and they’re not close to the NBA’s youngest team. But with 82 games and the postseason still in front of them, the Lakers are incredibly optimistic about the chance they’ve been given to add a 17th championship banner to the Staples Center rafters. Los Angeles has said almost nothing about Miami, Oklahoma City, Boston, San Antonio or the other NBA title contenders in the preseason, focusing entirely on the work still necessary to turn this disparate group of All-Stars into a cohesive unit. Howard, a six-time All-Star with the Orlando Magic, was acquired by Los Angeles in a four-team deal involving Andrew Bynum last August. Although Howard has just one year left on his contract, he has embraced the Lakers’ tradition and history, making it clear he’s quite determined to follow in the footsteps of Shaquille O’Neal, Kareem Abdul-Jabbar, Wilt Chamberlain and George Mikan. On the opening day of training camp, Bryant designated the easygoing center as his successor as the Lakers’ franchise player when the 34-year-old Kobe walks away, perhaps just two years from now. Bryant isn’t done yet, however — and he has never played with a point guard of Nash’s abilities. The two-time MVP agreed to move to Los Angeles in a sign-and-trade to stay closer to his three children in Phoenix, yet he seems to be an ideal fit with the Lakers, whose biggest positional deficiency has been at point guard for several years. Nash still isn’t sure how all of the Lakers’ pieces will fit together, but after several mostly mediocre years with the Suns, the 38-year-old Canadian is grateful for a real chance to chase his first ring. Coach Mike Brown has the keys to this impressive vehicle, and he acknowledges he’s mostly trying not to crash it. He has installed elements of the Princeton offense to encourage the Lakers to be mobile and creative on offense, but the defense-minded coach is most excited about a unit backstopped by Howard, the shot-blocking defensive dynamo. Much of that confidence is based on Howard, who is still a bit peeved he didn’t win another Defensive Player of the Year award last spring despite his early end to the season for back surgery. Bynum thrived on defense at times, but the Lakers believe no center can match Howard’s combination of athleticism and intelligence. “He can make plays defensively that no big man outside of Bill Russell can make,” Bryant said. The Lakers’ weaknesses might include their bench, which was the NBA’s least productive group last season. Antawn Jamison, the high-scoring forward who has mostly spent his 15-year career as the best player on bad teams, should inject more offense as a reserve, while Jodie Meeks and Chris Duhon will provide a new look in the backcourt. Jordan Hill, Steve Blake and Devin Ebanks return from last year. But it’s tough to worry about the Lakers while Howard, Nash, Bryant, Gasol and World Peace are running drills together in practice. They’re still getting to know each other, but they all sense the potential to become something greater than the sum of their parts.